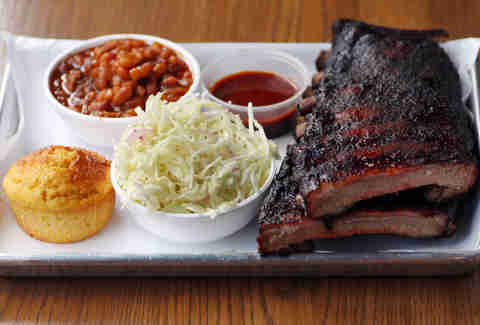 As Tupac once rapped, "I see no changes... except for in the Chicago BBQ scene, particularly over the last year." 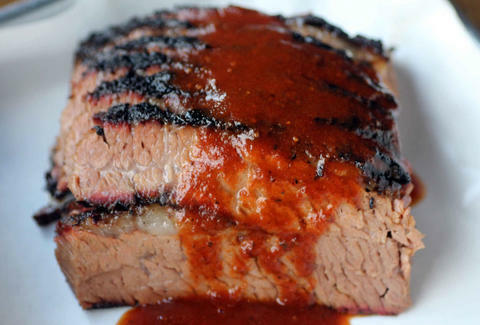 And Tupac's right (of course he is): in just the last year, we said goodbye (Honey 1 BBQ) and hello (Dinosaur) to enough 'cue-eries that we thought it was time for a revised list of Chicago's best BBQ joints for 2015. 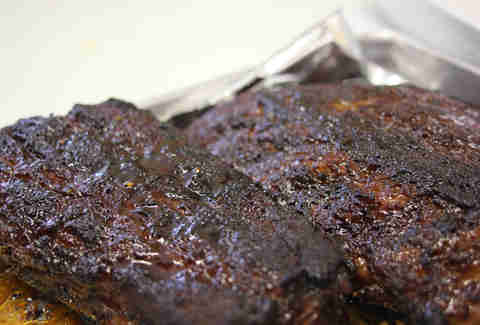 The list has expanded to 12 spots -- and we've included which smoky meat you should eat at each of them. South Side-style is cooked over a live fire in a glass-walled smoker, and it’s all about pork -- ribs, yes, but also two scrap meats from the stockyards -- rib tips, and the spicy sausages called hot links -- served under white bread and over fries, and swimming in sweet-hot sauce (unless you ask for it to be left out). Be prepared to take it to-go -- there’s rarely seating, and money and ‘cue are usually exchanged through bulletproof glass (more info on the South Side-style, here). With Honey 1 BBQ now departed for the South Side, this is the closest example of South Side-style BBQ you can get north of the Eisenhower Expressway. It offers tasty, smoky rib tips and links and keeps a second, no-pork smoker for folks in the area who don’t eat pork (they get “west side steak”). The South Side’s beloved Uncle John’s is gone, but luckily it spawned heirs among different members of pitmaster Mack Sevier’s family, and this one -- run by his daughter and her family -- is, for one thing, the easiest to get to (right off the Dan Ryan). The rib tips and sage-tinged smoky hot links are awfully close to Dad’s, and so is the sweet-hot sauce. Recently re-opened, this BBQ stand attached to a motel (let your imagination roam) does fine ribs and tips, but the move is the sage-flecked hot links created by former pitmaster Mack Sevier, who went on to own (now-closed) Uncle John’s. 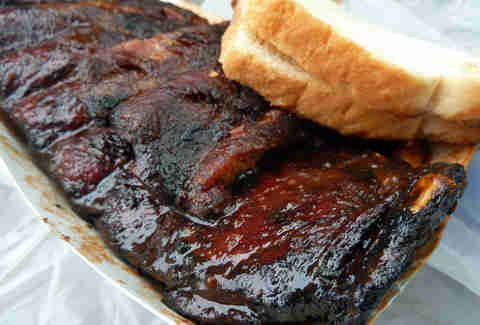 The city’s oldest BBQ stand helped establish the rib tip as Chicago’s bargain BBQ meat of choice, but the real glory here is a stack of juicy, smoky spare ribs in the vinegary sauce that put Lem's on the map back in the 1940s. 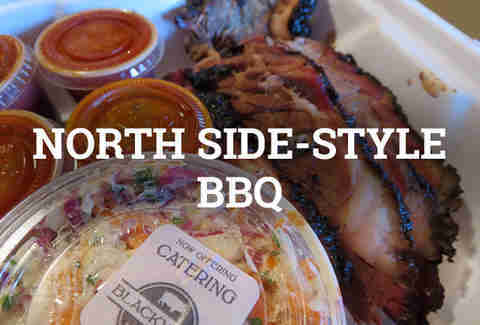 Call it "BBQ for the Food Network era"; in the last decade, the North Side has seen an explosion of places synthesizing the best-loved barbecue styles from around the country, with Texas-style brisket next to Memphis pulled pork and ribs, and mustardy sauces from the Carolinas... if you swing that way. Here’re the top seven that pay tribute to tradition, while taking it in their own directions. 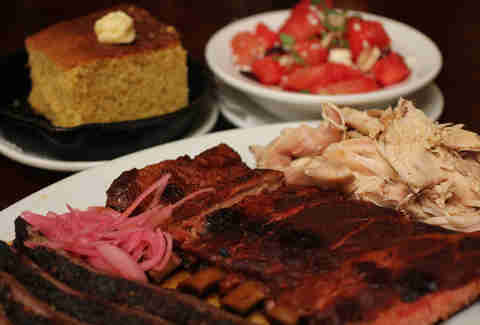 Real BBQ in the Loop? What sorcery is this? In a pair of fast food-like locations (the new patio-equipped shop sits near Union Station), these guys dish up freshly smoked brisket, pulled pork, and more, all of which you will take back to the office to make your coworkers insanely jealous. Just be sure to get yours by 3pm, when the shops close. Easily the swankest barbecue spot in Chicago right now, Chicago Q feels like a place you’d go to watch the Derby... if you owned a horse running in it. Competition BBQ champion Lee Ann Whippen’s ‘cue is strongest on ribs and the lusciously fatty (American Kobe, not Wagyu) brisket, but the Southern sides are plenty good too, and you want to leave room for the carrot cake. Restaurateur Brendan Sodikoff breaks out the honky-tonkyest faux-roadhouse a city of eight million ever saw. Brisket, pulled pork, and the juicy hot link are all first-rate -- the ribs less so -- but if you just want a trashy quickie from the bar, get the Frito pie loaded with the brisket chili. 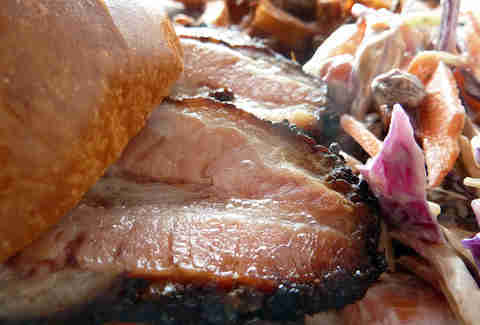 The pork belly sandwich -- thick slices of smoky bacon-to-be piled on a sandwich -- is the OMFG on the menu, but beyond that, this is a good, overlooked spot that does quality brisket (including brisket tacos) and pulled pork. Well, maybe not that overlooked, since it just opened a second location in BBQ-starved Andersonville. With his South Side location in the shadow of the Sox, Memphis-area native Joe Woodel explains about 50 times a day that he’s not serving South Side Chicago tips and links -- instead, this is Tennessee-style pork, chicken, and brisket spot, with an impressive array of sauces and some very tasty Southern sides. Texas barbecue with Asian sides proves to be an inspired combination (who really needed cole slaw, anyway? 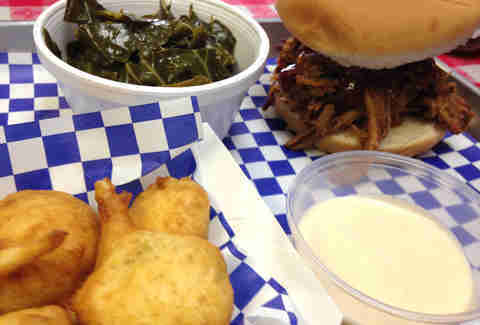 ), and it’s no disrespect to the meat to say that it’s the one BBQ place where I could also be tempted away by fried chicken -- it’s great, too. 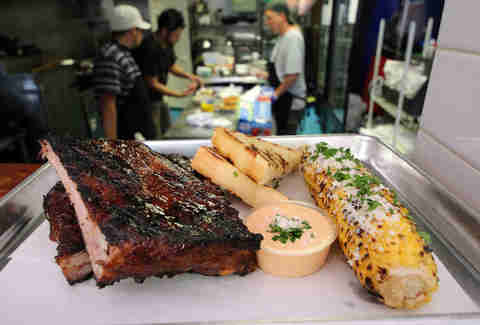 No seating, but you can head over to the bar next door and have your 'cue brought over. 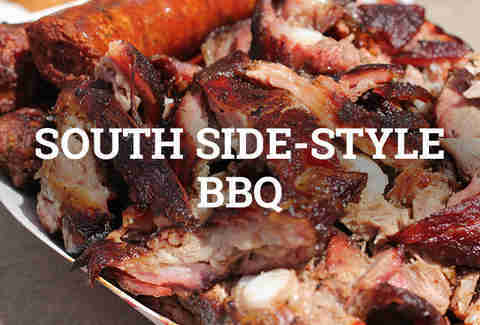 Smoque kicked off the BBQ movement on the North Side not quite a decade ago, delivering great Texas-style ‘cue. It still has lines out the door today, but it's a model for customer service in a busy joint. 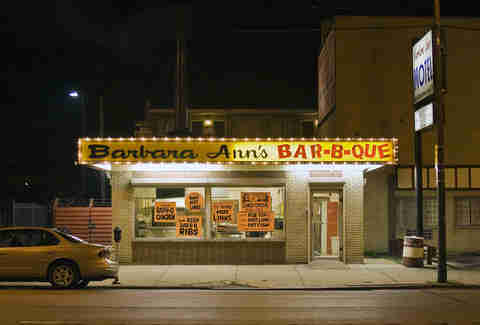 No Chicago BBQ tour would be complete without a visit to this spot.